Do you ever do “clean out the fridge” nights? If not you should think about doing it! Food waste is a very serious issue, and one way to prevent it is obviously to throw less food in the trash. But if you don’t know what food you have, it can be very easy to forget about it until your produce liquefies or grows a weird-colored fuzzy coating of something you do not want to eat. Clean out the fridge meals help prevent that! Basically, just take a look in the fridge. Not just the shelves but also the doors and drawers. And then try to think of a way to use up those food items! Soups are always a good bet, as are casseroles, burritos, omelets, and more. This one was inspired by 2 baked potatoes, and a half bag of getting-soft spinach. 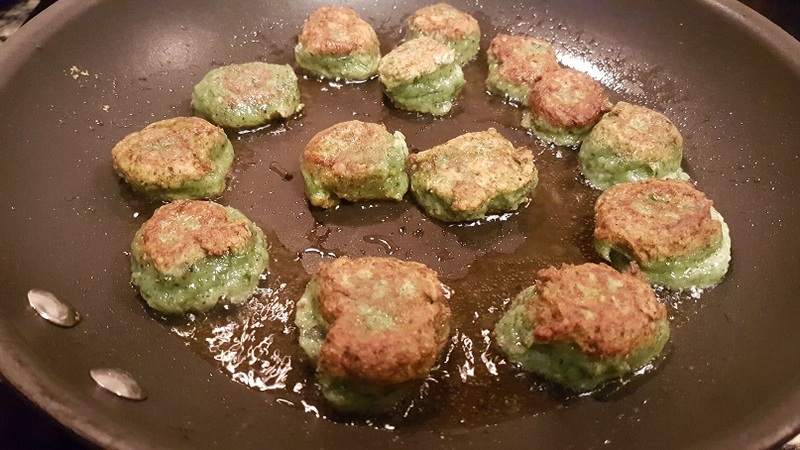 I went to Google for inspiration, as I usually do, and found this recipe for Potato Spinach Gnocchi. 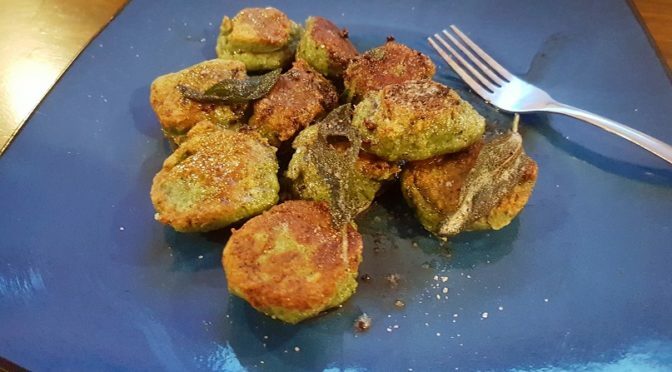 I’ve made my own gnocchi before, using both butternut squash and acorn squash, so I knew that veggies are easy to hide in the wonderful pillowy dumplings. 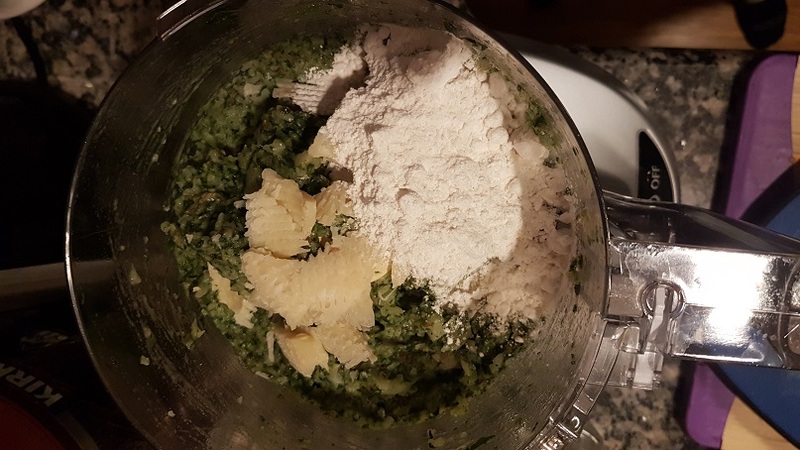 So I decided to add the spinach to create green gnocchi! Because why not. But I also decided to pan-fry rather than boil them, because I was craving a cripsy coating. You can stop at Step 1 and boil, but I’d recommend the frying route. 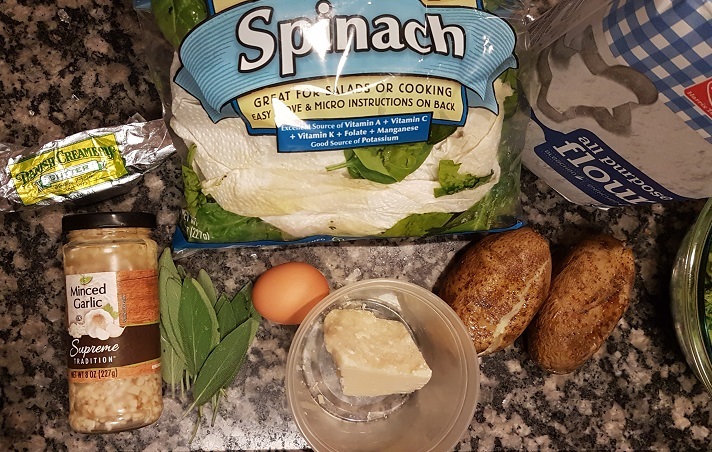 I also pared down the prep time by microwaving my spinach rather than steaming and draining, and had already cooked potatoes. If I didn’t I would have microwaved them too. All together, this can be on the table in less than 30 minutes! Not only do these taste a bit like french fries, but they also count as a vegetable and are healthy for you! Win win. Top with whatever sauce you prefer and enjoy. Optional: black pepper, salsa, etc. Step 1: I started with potatoes I baked the day prior, otherwise bake your potatoes in the oven or microwave. Similarly, if using frozen spinach, thaw it and squeeze out the water. I microwaved my fresh spinach for about 2 1/2 minutes with a cup of water next to it in the microwave. You can do the mixing and mashing by hand, but I prefer my hand dandy food processor. Mix up the potato well, then add the spinach. Process until well combined. Add the garlic, Parmesan, and flour, and process until a thick dough forms. Step 2: Using 2 teaspoons, scoop little balls of dough into a frying pan set to medium with olive or coconut oil. Fry for 2-3 minutes, flip, and fry on the other side. My pan held about half the dough, so I moved them to a paper towel covered plate while I cooked the other half. Step 3: Optional – at this point you can enjoy your fried gnocchi with marinara, pesto, alfredo, or whatever sauce tickles your fancy. Since I have an abundance of sage right now, I made a sage brown butter sauce (like I used on my butternut squash ravioli). Melt the butter in the pan. 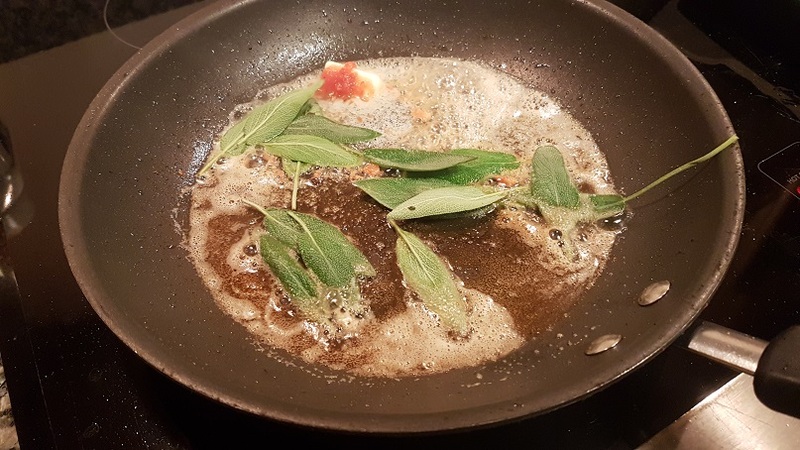 When barely bubbling, add the sage leaves, and fry for about 2 minutes, until crispy. Do not over cook or the butter will burn. I also tossed in a teaspoon of my Reaper salsa, for a little bite, and it was just enough.